I would think so. Mine were so large I had to slice them. Thanks for that tip Beth. That makes a lot of sense. I will add that info in. Hi! I love the Chackboard labels you made. 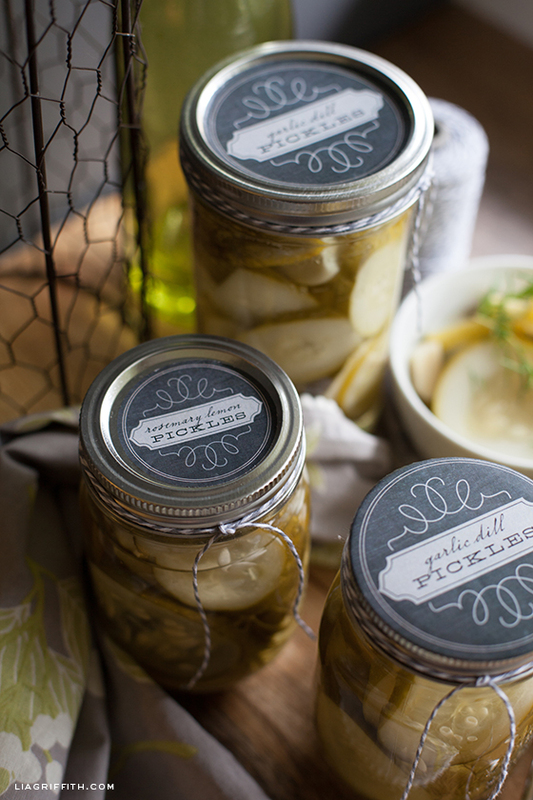 Is there any chance of all of the patterns from the 2″ editable labels being made into the large size for the Wide-mouth jars? I really like the one style you have and would love to see the others! The download button will take you to worldlabel.com/blog and you can download them for free there. Hi Lia ~ I’m writing a holiday guest post for a sewing site that is also looking for holiday printables. Can you forward me your email so we can get the proper permissions from you? Thanks! and great site!!! That sounds great. My email is lia at liagriffith dot com. My cucumber plants went crazy this year as well. 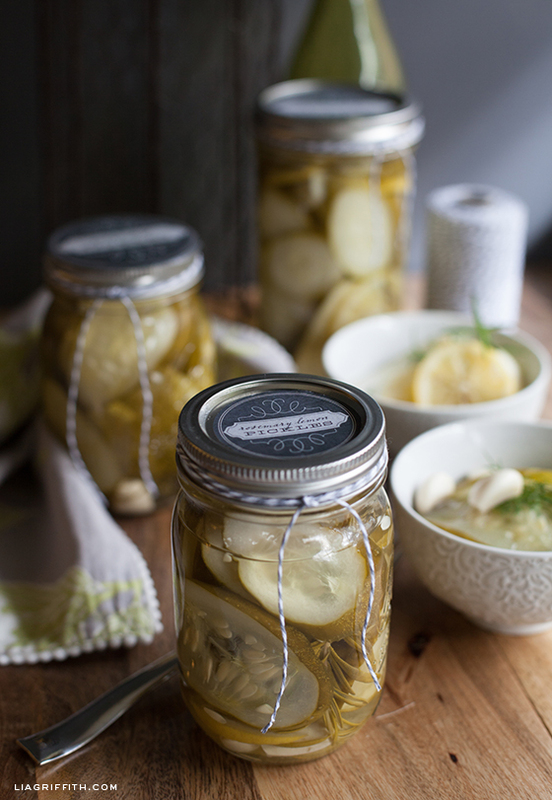 I have a refrigerator pickle recipe that I bought the ingredients for and am just waiting for a few free moments to make them. How were your tomatoes? Mine were only so so. 🙁 Yes, I have been busy on inside projects too. 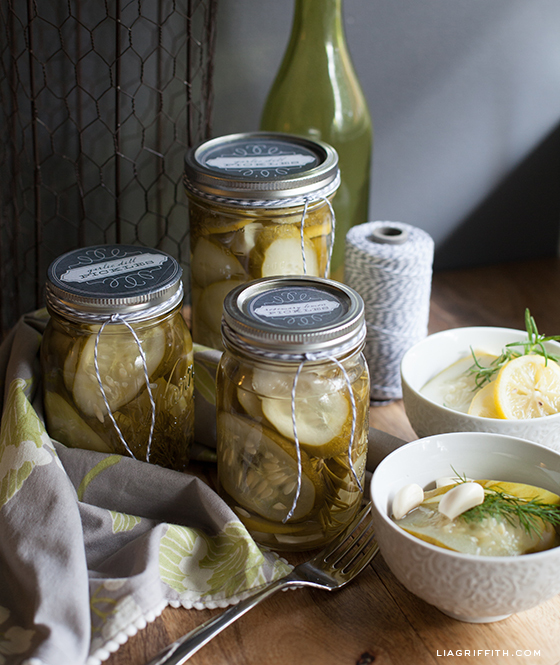 I may even try more canning. These look delicious! It’s great that you designed a label for the jars. And I absolutely LOVE your presentation- your pictures are always amazing! Those are SO beautiful. I am so glad that I found your site! No, but you can certainly add it to this recipe if you like. I keep my cucumbers in the refrigerator until I sliced, to keep them crisp. As for the granules. . . I have yet to know what they are made of so I shy away from them. So far, my pickles are perfect, but if Pickle Crisp is natural and list the ingredients, I would try it next year. Let me know if you have info on what it is made of.